For years, Dr. Yung and his team have been studying treatment options for patients with Glioblastoma multiforme (GBM) –the most deadly type of brain cancer – with an average 18-month lifespan after diagnosis. Dr. Yung is focused on drugs that target a gene called PI3K, which is a key factor in about 30% of GBM cases. His team collected glioma stem cells (GSCs) from GBM patients and developed a special panel of cell lines to investigate patterns of resistance to P13K inhibitors. The researchers are figuring out the molecular profile of these GSCs to identify potential targets for drug development. Results from the P13K studies have shown that the molecular profile of GSCs contain increased levels of Wee-1, which is a protein that controls cell division and growth. Following these results, the team then combined a P13K inhibitor with a Wee-1 inhibitor and found there was a greater inhibition of cell growth and the cancer cells were induced into cell suicide. Plus, when they tested the same inhibitors on complex GBM tumor models, they discovered similar benefits. These findings reveal molecular targets and designs for combination therapies that could lead to new treatments for GBM patients. Earlier in his career, Dr. Yung led the study that paved the way for FDA approval of temozolomide (Temodar®) for GBM and led the registration study that preceded FDA approval of the drug bevacizumab (Avastin®) for recurrent GBM. W.K. Alfred Yung, M.D, earned his undergraduate degree from the University of Minnesota and attended medical school at the University of Chicago. He conducted his internship and residency training at the University of California, San Diego, his chief residency at Cornell University and his fellowship at Memorial Sloan Kettering Cancer Center. Dr. Yung decided to make medical research the focus of his career because he was frustrated by the lack of treatment options for brain cancer patients, and he was recruited to help build the neuro-oncology department at the MD Anderson Cancer Center, where he has worked for 35 years. His many roles at MD Anderson have included deputy chair of Neuro-Oncology and medical director of the Neuro and Supportive Care Center. In 2001, he was co-director of the Brain Tumor Center, which he helped expand. He led the department of Neuro- Oncology for 16 years, as ad interim chair from 1999-2002 and as chair from 2003-2015. 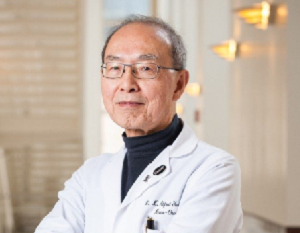 In addition to his fellowship with NFCR, Dr. Yung’s work has been advanced by 30 years of continuous funding by the National Cancer Institute. He has been co-chair of the NCI Brain Malignancy Steering Committee since 2011 and is the Special Advisor to the CEO of the National Brain Tumor Society. Dr. Yung was also named to the Blue Ribbon Panel of experts advising the Nation Cancer Moonshot Initiative, which is led by former Vice President Joe Biden. Dr. Yung is also on the Executive Committee of GBM AGILE, which is a revolutionary global collaboration to test and develop new brain cancer treatments that NFCR has taken a leading role on. Throughout his career, Dr. Yung has been published in more than 300 peer-reviewed journals and he served as editor-in-chief of Neuro-Oncology from 2007-2014. Your ticket for the: W. K. Alfred Yung, M.D.